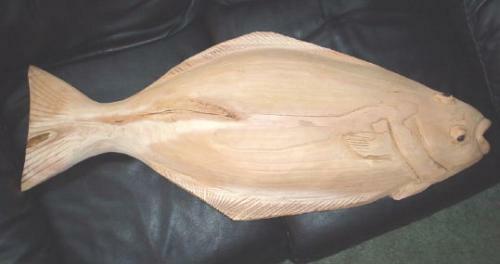 The spalted birch salmon was a new addition to Eric's collection this summer, 2009. 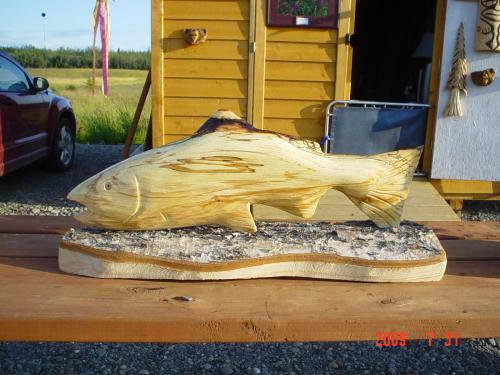 After using his chainsaw to create the fish sculpture, he noticed the gorgeous colors created by the spalting. He decided that this salmon needed to be mounted and so thought using the actual birch bark from the same tree from which the salmon was created would be a nice touch. It became the most popular fish sculpture of the season. Right view of the spalted salmon already displayed. Again, notice the gorgeous color-effect of the wood created by the spalting. 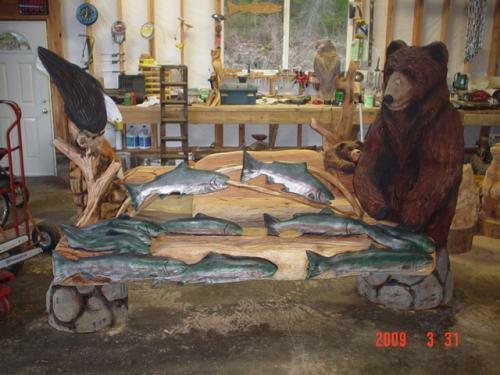 The Gauntlet bench depicts a portion of the salmon's obstacles that must be overcome in order to reach its spawning grounds. The fish on the back of the bench were added, but all the others were carved into the bench. Using his chainsaw and grinder, Eric calls this his 2009 masterpiece. It was definitely THE HIT of the season. 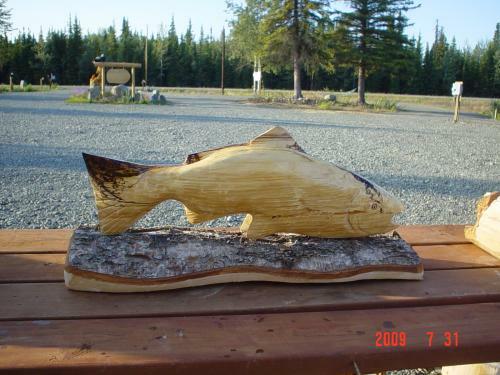 Here is a side profile of a halibut chainsaw carving. Eric has created several sizes of the Alaskan halibut and he gives the client the choice between displaying the art piece from the side profile or from the oft-viewed upside down perspective. For halibut lovers, this is a must-have piece of art.